These pasta shells look messy but are very delicious! 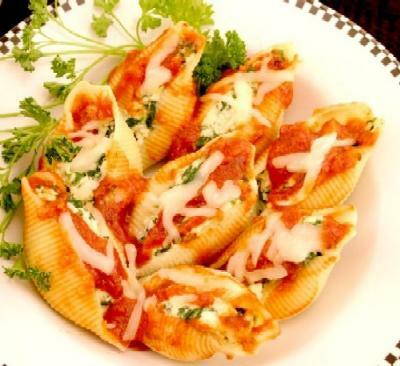 You will love these stuffed giant pasta shells topped with lots of cheese. In a pan, brown chuck, onion and garlic; drain. Stir in cheese, crumbs, parsley, and egg. Stuff shells. Spoon 1/4 of the sauce in a 9 X 13 inch pan. Place 1 layer of shells and spoon the rest of the sauce over; sprinkle with grated cheese and bake at 400 F (200 C) degrees for 25 minutes. Serve with added grated cheese. The picture is makin me hungry. This looks great.